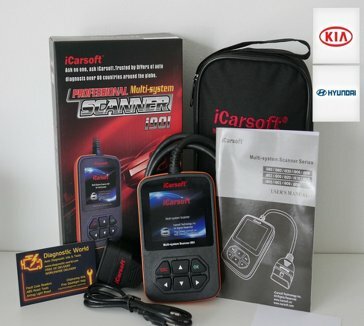 The Kia & Hyunda iCarsoft i901 is a multi system diagnostic tool which has been designed to communicate with the main systems within your Kia or Hyundai such as SRS airbags, ABS Antilock Brakes,Glowplugs, ESP, engine & powertrain tranmission modules. The i901 will allow you to diagnose & reset fault codes, and allow you to turn off the dashboard warning light with a few button clicks. It will also work on other main systems such as parking sensors, air suspension, interior lighting, steering column, Xenons, overhead panel. instrument cluster, ESM, CGW central gateway, AC air conditioning & MORE. This kit is one of the best diagnostic tool cables for Kia & Hyundai COMMUNICATIONS.